Former White House strategist Steve Bannon wanted former Fed Chair Janet Yellen to stay on for another term. Former Federal Reserve Chair Janet Yellen evidently has a huge fan in former White House chief strategist Steve Bannon. 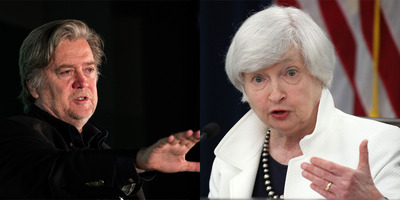 Bannon, the former president of the the far-right site Breitbart, said he wanted Yellen to stay on as Fed chair for a second term but did not speak up during deliberations over the new pick. President Donald Trump instead selected Jerome Powell to lead the Fed, making Yellen the first Fed chair since 1979 not to be appointed for a second term. Despite Bannon’s affinity for Yellen, he said he went along with Trump’s pick of Powell. According to Bloomberg, Bannon wanted Yellen because her slow pace of monetary tightening was more likely to allow wages to increase. Yellen stepped down on February 3, leaving the Fed altogether instead of staying on as a governor. Powell took over two days later.